In an attempt to make my life a little easier, I'm planning all of our dinners for December at once. As hard as it if for me to believe that the first day of December is upon us, there's no denying the fact that the holiday season is in full swing. I survived cooking our first Thanksgiving dinner at home (more on that to come) and, over the weekend, we introduced Caroline to a special family tradition. We also spent some quality time visiting family on Stephen's side, and I managed to find a moment to start working on this year's holiday sewing project. 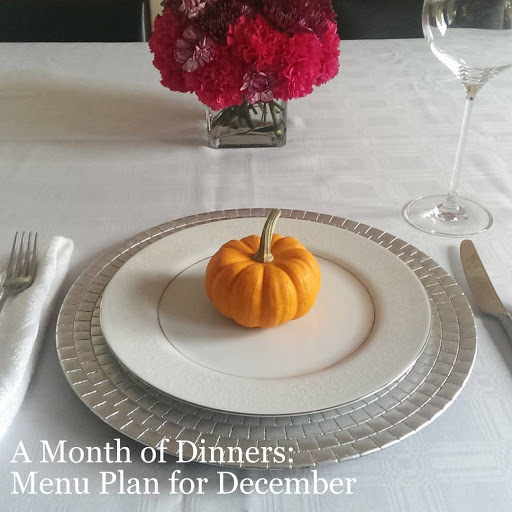 Before the day gets away from me, I want to share our menu plan for the coming month. The menu plan was thrown together a little more haphazardly this time around, but I didn't have as much time to devote to recipe research as I would've liked. Quite honestly, I wouldn't be surprised if I wound up going off-script in December... but here's what I've come up with for the time being.